Mercedes-Benz has unveiled the new C253 GLC Coupe facelift, which joins the updated X253 GLC that was presented just a few weeks ago. Aside from the usual design revisions, the GLC Coupe also sees new technologies being added to it so it can continue its fight against the BMW X4. 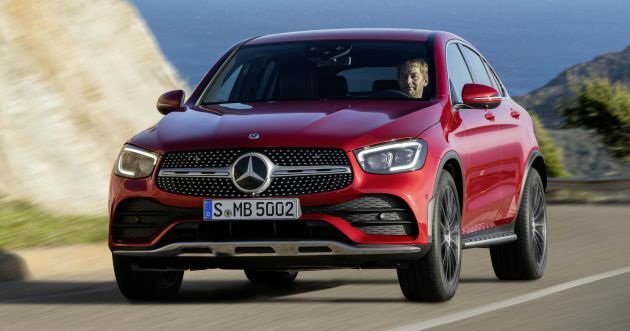 In the case of the former, the GLC Coupe’s face gets a nip and tuck, and features a more angular grille design compared to its non-coupe sibling. This particular unit in the photos is fitted with the AMG Line package; hence the chrome pins within the grille and a new take on the single louvre. The standard-fit LED High Performance headlamps are also of a new design, and they come with LED light strips that run along the edge of the clusters, which act as daytime running lights/indicators. Further down, the lower apron is a lot bolder in appearance, with a more pronounced “A-wing” and larger air intakes. Along the bottom of the vehicle from front to back, you’ll also find chrome items that make up the front guard, side steps and rear bumper garnish. 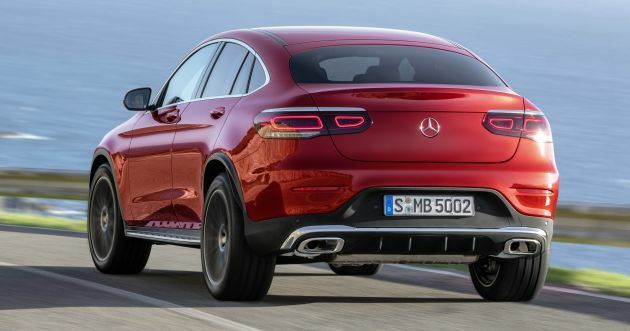 On the mention of the rear, the GLC Coupe references the latest W167 GLE and GLC with its taillights, which carry ring-shaped graphics within them. Other tweaks include a more expressive diffuser-like element and reprofiled exhaust exits. Moving inside, the GLC Coupe remains largely unchanged from before, with the most notable addition being the 10.25-inch touchscreen display (1,920 x 720 pixels) on the dashboard. The alternative is a 7-inch unit (960 x 540 pixels), and both screens are linked to the Mercedes-Benz User Experience (MBUX) infotainment system. Interacting with the MBUX system is done via a number of ways, including by using the touchscreen, Touch Control buttons on one of two versions of the new multifunction steering wheel (normal and AMG Line), the touchpad on the centre console, gesture control with the Interior Assistant, or by using the “Hey Mercedes” prompt. These changes, along with the new 12.3-inch display within the instrument binnacle, are identical to what the standard GLC received a few weeks ago. An optional Energising comfort control combines various in-vehicle systems to create an optimum environment depending on the selected programme. The GLC Coupe gets a range of driver assists, with the Driving Assistance Package adding Active Distance Assist Distronic, Active Steer Assist with Active Emergency Stop Assist, Active Lane Change Assist and an emergency corridor function, Active Speed Limit Assist, Evasive Steering Assist, Active Lane Keeping Assist, Active Blind Spot Assist and Active Brake Assist with turn-off and cross-traffic functions. At launch, the engine line-up includes the new M264 2.0 litre turbocharged four-cylinder petrol unit that is used in the GLC 200 4Matic and GLC 300 4Matic. Both feature the EQ Boost 48-volt mild hybrid system, which provides a 10 kW (14 PS) and 150 Nm boost under acceleration, as well as energy recovery and coasting features. The GLC 200 offers 197 PS and 320 Nm of torque, while the GLC 300 has 258 PS and 370 Nm. On the diesel side of things, there’s the GLC 200 d (163 PS/360 Nm), GLC 220 d (194 PS/400 Nm) and GLC 300 d (245 PS/500 Nm), all with 4Matic as standard. These variants come with the OM654 2.0 litre engine that replaces the OM651 2.2 litre mill. A nine-speed 9G-Tronic automatic gearbox is standard, as is sports suspension with adapative damping, although the latter can be swapped out for an infinitely-adjustable Dynamic Body Control damping system that can vary the damping force on each wheel, with Air Body Control air suspension also available. The post C253 Mercedes-Benz GLC Coupe facelift revealed – updated styling, new 48-volt mild hybrid engine, MBUX appeared first on Paul Tan's Automotive News. 0 Response to "C253 Mercedes-Benz GLC Coupe facelift revealed – updated styling, new 48-volt mild hybrid engine, MBUX"